UNSW is one of Australia’s leading universities and its School of Photovoltaic and Renewable Energy Engineering is highly regarded as world leaders in the field. They have spearheaded research and the commercialisation of high performance silicon solar cells for two decades and have made a breadth of contributions to the solar industry. 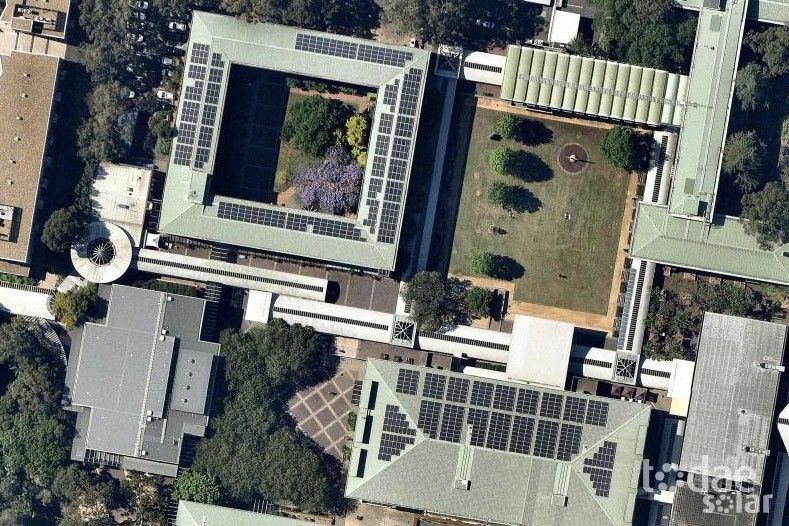 In late 2015, Todae Solar completed a 237kW commercial solar system for UNSW’s Kensington campus. One of the biggest challenges on this project was the complexity of the protection approval with the distributed network service provider (DNSP). With much persistence from our projects team, the approval was brought across the line. Further to the DNSP requirements, UNSW themselves also had very “meticulous design and quality requirements”, which was acknowledged by a representative from UNSW who expressed satisfaction with the quality of the system delivered. In addition to the financial and environmental benefits, we hope the education benefits for renewable energy are realised for the students at UNSW. It was a privilege for Todae Solar to work with and install a solar system for such a prestigious institution. Click here to see the client testimonial.